The U 5 K (S) is a very powerful and versatile submersible pump for both permanent and portable use. Thanks to the removable sieve basket, it is possible to increase the throughput diameter from 10 mm to 20 mm. This basement wastewater pump also has an integrated flushing device to reduce the accumulation of deposits and a shallow, built-in suction system for the disposal of floodwater. Powerful and durable the Floodbox tackles the problem and helps people affected by floodwater to react quickly and efficiently. Simply put the carrying cage with the pump on the ground and pump the water from the building using the 12.5m long fire hose. 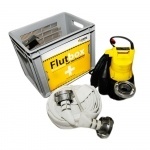 The heart of this emergency kit is the powerful multi functional submersible pump. Taken out of the carrying cage it can be used stationary or as a portable tool for a range of dewatering situations.